Week 17 of the NFL regular season schedule has been completed, closing the chapter on the 2018 season and giving each of the 2018 NFL Draft first-round picks a taste of what’s to come in their NFL career. Like many who have come before them, Some of the 32 first-rounders have struggled to find their feet straight away and will look to rebound in 2019, others have not qualified for a grade either based on small snap counts or not playing altogether. On the other hand, some players have played like they’ve been in the league their entire life, and cemented themselves as potential stars of the future. This time last year, few people saw Baker Mayfield as a slam-dunk first overall pick — but we did, and boy did he prove us right in his rookie year. Since taking over from an injured Tyrod Taylor in Week 3, Mayfield reignited the city of Cleveland, leading them to a 7-8-1 record and setting the NFL record for most touchdown passes by a rookie in the process. Mayfield graded north of 70.0 in nine of his 14 games, and recorded grades of at least 80.0 in seven of those contests, while he put a colossal 39 big-time throws on tape, the third-most ever recorded by a rookie. 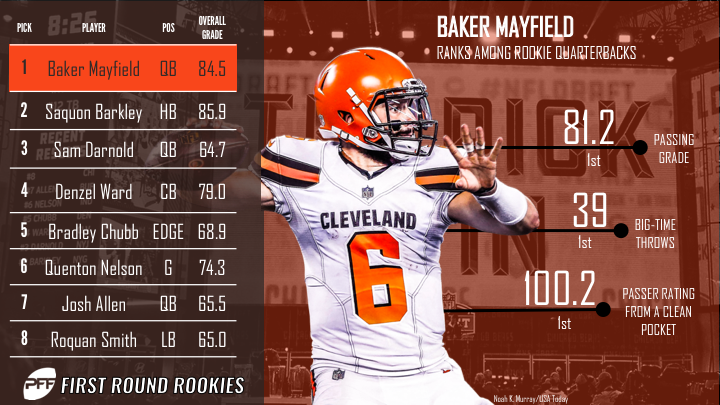 Mayfield will end his debut season with an adjusted completion percentage of 74.0%, a 100.2 passer rating from a clean pocket and an overall grade of 84.5, which respectively rank fifth, fifth and second among rookies in the PFF era. The future is bright in Cleveland. Saquon Barkley was as advertised; he nothing short of sensational in his rookie year. Ultimately, it did not matter to the 5-11 Giants, who once again find themselves near the top of the NFL Draft looking for the next franchise quarterback. One thing is for sure; whoever lines up under center for the Giants next year has a bonafide star at the running back position; a playmaker that few can stop once he gets going. In his 16 games, Barkley racked up 1,307 rushing yards from his 261 attempts, with 872 of those yards coming after contact (the fourth-most by a rookie running back in the PFF era). However, as great as Barkley was as a runner, his real value came from his receiving snaps, where he caught 91 of his 114 targets (both of which broke PFF records for a rookie) for 721 yards. His average of 1.54 yards per route run ranks 10th among the league’s backs this year, but his 31 missed tackles forced as a receiver set a record for the most by a rookie running back in the PFF era. Barkley will end his rookie season with an overall grade of 85.9, the ninth-best mark ever recorded by a rookie. Darnold has had his fair share of ups and downs this year, but his performances down the stretch should give the New York Jets’ fanbase hope for the future. From Week 14 on, Darnold completed 125 of his 140 passes for 931 yards, six touchdowns and one interception. He produced eight big-time throws and just two turnover-worthy passes, and most impressively, he produced a 118.5 passer rating from a clean pocket which was the second-best mark among all quarterbacks in that span. Darnold’s poor early-season decision making and his league-leading 17 turnover-worthy passes over the first nine weeks of the season are heavily reflected in his season grade, but if Darnold can pick up where he left off from this year, the Jets will be in a very good spot. Injuries took their toll on Ward towards the end of the season, but his early-season play is yet another reason for Browns fans to get excited about the future. In his 13 games for the Browns, Ward allowed a passer rating of just 70.7 on throws into his coverage, and he yielded an average of 0.88 yards per coverage snap. Both of those marks rank fourth among first-year cornerbacks this year, and both are made more impressive by the fact that Ward has seen the most targets (89) and played the third-most coverage snaps (540) among rookies this year. The Browns’ bright future gets brighter. From a box score standpoint, Bradley Chubb couldn’t have done much more for the Broncos in his first year in the league. The first year edge rusher racked up 13 sacks, eight hits and 37 quarterback hurries across his 456 pass-rushing snaps, and his 58 total pressures not only rank first among rookie edge defenders this year, but they’re the 19th-most among all players at the position. If Chubb is to take it to the next level in 2019, he’ll need to return to his college form when it comes to run defense and tackling, as his 2018 run-defense grade of 69.6 ranks 49th among all players at the position this year while his tackling grade (he missed 11 tackles on 47 attempts) of 40.2 ranks 92nd.